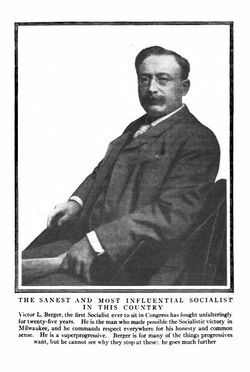 Victor Luitpold Berger (February 28, 1860 – July 16, 1929) was a journalist and a founder of the Socialist Labor Party in the United States. He was the first socialist elected to the U.S. House of Representatives, in 1910. Socialism has never taken root in the United States, except perhaps in certain industries such as health care. Socialism is prevalent in western Europe today. Berger was born on February 28, 1860, in Nieder-Rehbach, Austria, and was educated in the Universities of Budapest and Vienna. He emigrated to the United States in 1878. He was a member of the International Typographical union and served as a delegate to the conventions of the American Federation of Labor. He was the editor of the Milwaukee Leader, a Wisconsin newspaper. In 1897 he married Meta Schlichting. After helping to found the Socialist party, he was a persistent member of its National Executive Committee. He also represented the party in Brussels at sessions of the International Socialist Bureau. He was the Socialist candidate for United States Senator in the special election in April, 1918, and was elected to Congress in November. Berger opposed America's entry into World War 1, which made him a target of the Wilson administration. On February 2, 1918, Victor L. Berger, together with Adolph Germer, J. Louis Engdahl, William F. Kruse, and Irwin St. John Tucker, were indicted by the grand Jury in the district court of the United States for the northern district of Illinois for a violation of sections 3 and 4 of title 7 of the espionage act. In 1919, Berger was sentences to 20 years in prison, but the conviction was overturned in 1921. Berger was re-elected to Congress, and on July 16, 1929 he was killed in a streetcar accident in Milwaukee. ↑ BERGER INDICTED FOR CONSPIRACY; Ex-Congressman and Three Chicago Socialists Accused of Spreading Disloyalty. JURY CITES 26 OVERT ACTS Irwin St. John Tucker, J.L. Engdahl, and William Kruse Codefendants with Berger. ↑ 6.0 6.1 Odd Wisconsin: Socialism was mainstream in Wisconsin 100 years ago. Wisconsin State Journal (by the Wiscosnin Historical Society). Retrieved November 24, 2016. This page was last modified on 30 June 2017, at 07:40.